Display the Quicken home page. Click on the Home tab. Quicken displays the Quicken home page. You remember this puppy. Click the Add An Account button to set up a new account. Quicken, of course, is no fool, so it displays the Add Account dialog box. The Add An Account button appears in the lower-left corner of the window. Set up a cash account. You can guess how to do this, can’t you? You indicate you want to set up a cash account and then simply step through Quicken’s questions about the account you want to set up. You need to give the account a name, for example, such as cash or pocket money. And you need to provide a starting balance value using the faithful, familiar Add Account dialog box. Click Next and then Done. When you finish describing the cash account, click Done. 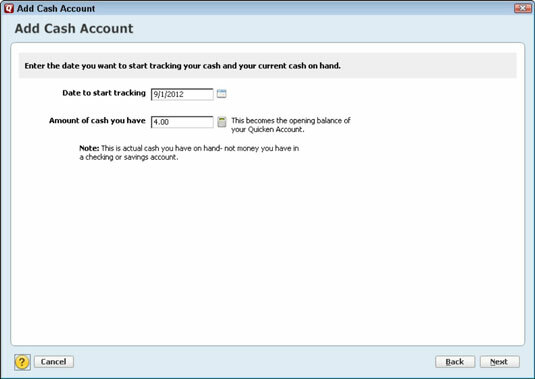 Quicken displays the new cash account in a register window.